Approximately 1,000 civic, corporate and community leaders attended the After School Matters® Annual Gala on Monday, September 19 at Chicago’s historic Navy Pier to celebrate 25 years of successfully providing after-school and summer programs to Chicago teenagers. Over the past 25 years, more than 200,000 teens have participated in the nonprofit organization’s hands-on, project-based after-school and summer programs in the arts, communications, science, sports and technology. This year alone, After School Matters provided 23,000 opportunities for Chicago teenagers to participate in the organization’s programs, which provide youth with an opportunity to explore and develop their talents while gaining critical skills for work, college and beyond. The Annual Gala, held in Navy Pier’s Lakeview Terrace and Aon Grand Ballroom, was presented by Blue Cross and Blue Shield of Illinois and hosted by the After School Matters Board of Directors. Gala Co-Chairs included Mellody Hobson and George Lucas, Denise and Matt Gibson, D’Rita and Robbie Robinson, and Dona and Sam Scott. Honorary Chairs included Mayor Rahm Emanuel and Ms. Amy Rule, and The Honorable Richard M. Daley. One of the Gala’s highlights featured teens from multiple After School Matters dance, music and vocal arts programs performing a medley of Prince songs. A gallery showcased the work of teens that participated in After School Matters programs this summer through hands-on exhibits and displays in music, drawing, painting, glassworks, photography, multi-media digital arts, print-making and jewelry-making, as well as interactive displays showcasing skills in sustainable energy technology and urban agriculture. All visual art pieces displayed at the event were available for purchase, and any not purchased will now be on sale at the After School Matters Gift Shop, located at 66 E. Randolph. All proceeds support After School Matters programming. 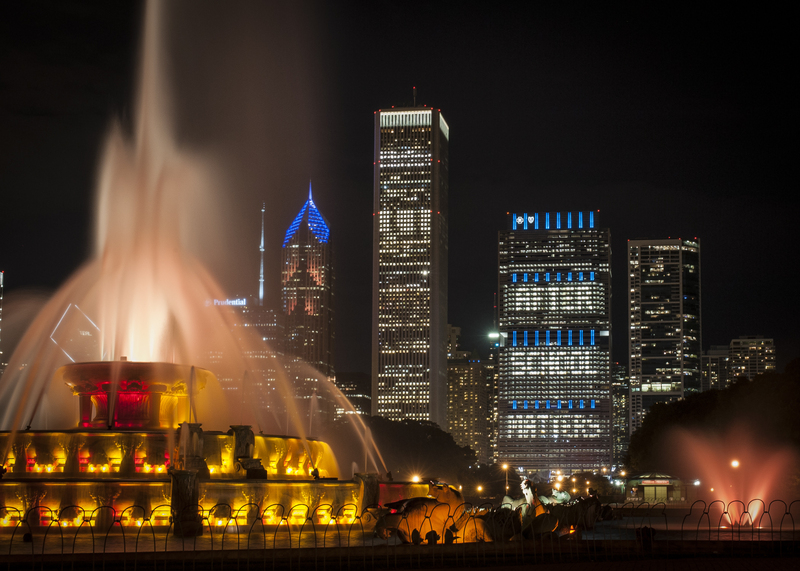 In honor of the Annual Gala, the Blue Cross and Blue Shield of Illinois headquarters skyscraper on Randolph Street was lit up to display “AFTER SCHOOL MATTERS” during the event in a show of support for the organization and its mission. Individuals, corporations, foundations and organizations interested in supporting and contributing to After School Matters can visit www.afterschoolmatters.org/support-us/give-to-asm/. Those interested in volunteering can visit www.afterschoolmatters.org/volunteer. Teens can search and apply for programs at www.afterschoolmatters.org/teens. Follow After School Matters on Twitter at @aftrschoolmttrs, on Facebook at www.facebook.com/AfterSchoolMatters and on Instagram at AfterSchoolMatters. Learn more at www.afterschoolmatters.org. After School Matters provides Chicago high school teens with high quality, out-of-school time opportunities to explore and develop their talents while gaining critical skills for work, college and beyond. Over the past 25 years, more than 200,000 teens have participated in our hands-on, project-based after-school and summer programs in the arts, communications, science, sports and technology. Programs take place at locations throughout the city including Chicago public high schools, Chicago Park District and Chicago Public Library locations, community-based organizations and downtown at the Gallery 37 Center for the Arts. www.afterschoolmatters.org.